Ronald A. Karp, the Managing Partner of Karp, Wigodsky, Norwind, Kudel & Gold, P.A., is heading into his 45th year of practicing law. For all of these years, his guiding principle has been an unwavering commitment to changing lives and making justice a reality. If you want to fully understand Ron’s philosophy of practicing law, read his Message from Managing partner. Changing lives is more than a slogan on the firm wall, it is at Ron’s very heart and soul. His greatest satisfaction is obtaining justice and compensation for victims faced with life-altering injuries or devastation from an accident. Ron is proud of the exceptional results his law firm has delivered to thousands of clients throughout the years. Ron is also proud that the firm is rated in the Top Tier by U.S News and World Report for law firm rankings. Among Ron’s most prominent cases, he is proud of representing a group of women at a Fortune 500 company that were sexually assaulted/harassed by their supervisor. The case resulted in an extensive, hard fought, jury trial culminating in a generous verdict vindicating his clients. (See his blog on Sexual Assault and Harassment on our website). Ron also represented Montgomery County Police Chief Charles Moose (famous for the capturing the snipers) in his First Amendment battle to publish his book Three Weeks in October, which became a New York Times bestseller. In Personal Injury cases Ron secured the very first million dollar jury verdict in the history of Frederick County, Maryland and had secured millions of dollars in settlements for victims of truck accidents. In 2017 he was selected as one of the Top Ten truck accident lawyers in Maryland. His cases have been featured on the front page of the Washington Post and NBC network news. Well-respected by his peers, Ron is selected time and time again to appear in Best Lawyers in America—a listing of the top one percent of lawyers in the United States. In 2017 he has been selected again to the Super Lawyers Top 100 list in BOTH Washington, D.C. and Maryland.. Ron was listed among the top 100 lawyers receiving the highest point totals in voting by his peers and a blue ribbon panel. With more than 100,000 lawyers in the Washington, DC/Maryland/Virginia area, this recognition by his peers in both jurisdictions is truly exceptional. He also has the highest peer rating possible from Martindale Hubbel and has been inducted as a Fellow in the Maryland Bar Foundation and the prestigious Belli Society. 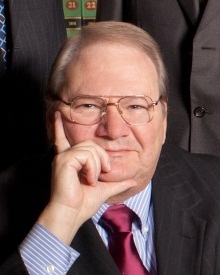 As the firm’s managing partner, Ron has been a frequent lecturer at trial lawyer seminars. He has been lead counsel in a numerous high-profile cases which have been referenced in The Washington Post, The Wall Street Journal, The Times of London, People Magazine and various network television programs. 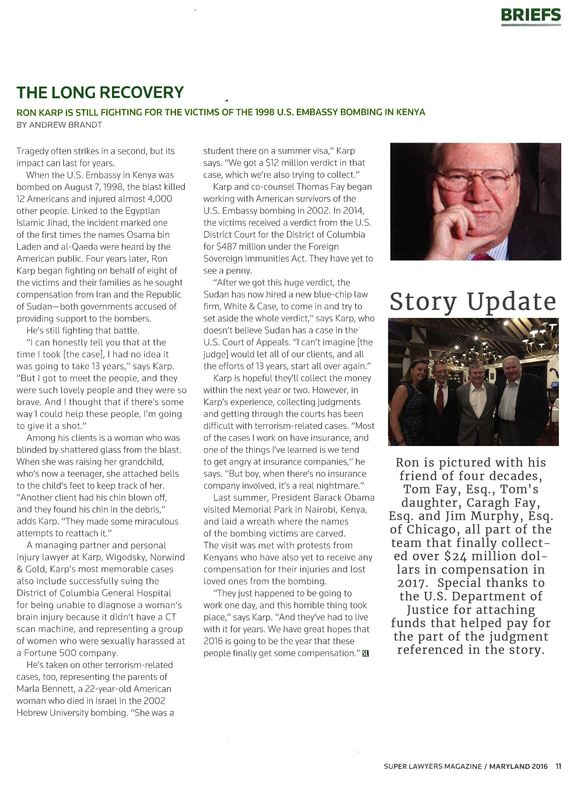 In Ron’s long career, he likes to cite, as an example of affecting many lives for the better, a case he tried against the District of Columbia which resulted in the busiest hospital in the city getting a CT Scan machine — Blake v. District of Columbia. The verdict was picked up by the Wall Street Journal in an editorial warning hospitals not to try to save money by cutting back on medical equipment. That case has since been cited throughout the United States when local municipalities are seeking sophisticated medical equipment for their hospitals. It was a case for which Ron was honored with the Trial Lawyer of the Year Award by his peers in Washington, D.C. In 2012, Ron’s son Andrew joined the firm, bringing with him one of the greatest joys of Ron’s legal career, the ability to pass on a commitment to changing lives and making justice a reality. District of Columbia, 1972 (federal and Superior Court). Recipient, Trial Lawyer of the Year Award, Trial Lawyers Assn. of Metro D.C.